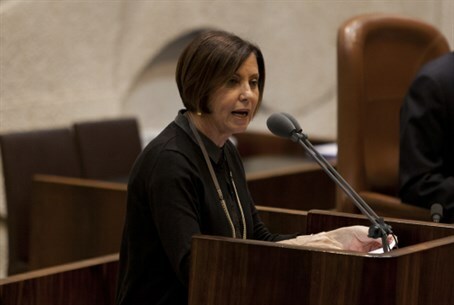 Meretz chairwoman attacks PM Netanyahu over his declaration that he will not evict any communities from the Jordan Valley. Meretz chairwoman MK Zehava Galon attacked Prime Minister Binyamin Netanyahu on Saturday, a day after Netanyahu made clear that he would not evict any communities from the Jordan Valley as part of a peace agreement with the Palestinian Authority (PA). “Netanyahu's remarks expose the fact that he is not a partner for a settlement - Netanyahu is a partner of the settlers,” charged Galon. The Prime Minister’s remarks on Friday came following his meeting with U.S. Secretary of State John Kerry on the sidelines of the World Economic Forum in Davos. "I have said it before and I repeat it today: I'm not going to evict a single community, I am not going to uproot any Israeli from his home,” he told reporters, adding that a peace agreement is not on the table at the moment and that even a framework agreement is not being discussed. "The Americans are talking about a suggestion for a framework for negotiations. This is not an agreement, but a path to making progress,” said Netanyahu. When reporters asked him whether he feared that continued construction in Judea, Samaria and Jerusalem could lead to boycotts of Israel, Netanyahu replied, "I'm actually seeing tremendous interest from international companies in coming in and investing in Israel." The issue of the Jordan Valley has become a point of contention in the talks between Israel and the PA, which insists on full control of the Jordan Valley – along with all other land that was under Jordanian control from 1948 to 1967. Israeli experts have warned that the area is strategically critical. Kerry spoke at the World Economic Forum after Netanyahu’s press conference, and warned that "today's status quo will not last forever." Kerry also stressed that Israel’s security must be ensured in a peace deal and noted that Israel cannot make peace with the PA so long as it fears that the Palestinian state will become another Gaza.